Office 365 refers to the subscription plans that includes access to Office applications and other productivity services. Moreover, user can easily export OST to Office 365 by this software. OST to Outlook PST Converter supports Windows 10, 8, 7 and all below versions. It also works with all Outlook versions i.e. 2016/2010/2007/2003 and below. This software convert OST to PST format without any difficulty. It easily converts data items of OST file such as emails, contacts, calendars, journals, tasks, etc to Outlook PST. Moreover, OST File to PST converter does not have any file size limitation, users can convert OST file of any size. As the user adds OST file, the tool starts the scanning process as the procedure completes OST to Outlook PST Converter enables the users to save scanned OST file on local machine. This feature is useful when OST file needs to open in future. Users can directly load the scanned OST file and save time. At times, users don’t want to export complete data. Therefore, OST to Outlook PST converter provides an option to export selected files or folders from OST file. Users can check/uncheck the particular items they want to export. It provides category option within Advanced Setting that allows you to select from various categories: Mails, Tasks, Calendars, Notes, etc. OST File to PST Migrator provides an option to convert data from specific dates only. For, this user just have to use the date-based filter option and specify the dates in ‘To’ and ‘From’ field. This tool export OST files that come under the specified date range to PST. There is no need to export all data users can easily transfer selective data items. This software provides the facility to import OST to Office 365. With this option, users can easily migrate all the data items such as emails, calendars, contacts and attachments to Office 365. 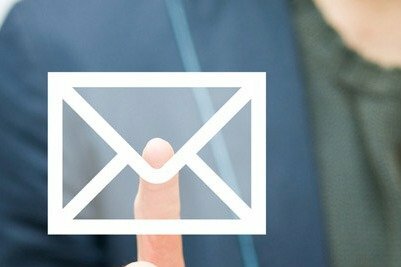 Moreover, users can also export selective emails to Exchange Online with this tool. After, the successful completion of migration of OST files to PST, this tool generates a complete export report. This report contains complete details of migration process with exported mailbox and heir destination path. Moreover, users can also save the report in CSV file format for future reference. With the help of this tool, users can easily convert OST emails along with attachments to Outlook PST format. In addition to this software keeps meta data of all items intact as the original. It includes to, cc, subject, size, etc. Moreover, tool preserves the original formatting of OST items even after the conversion. 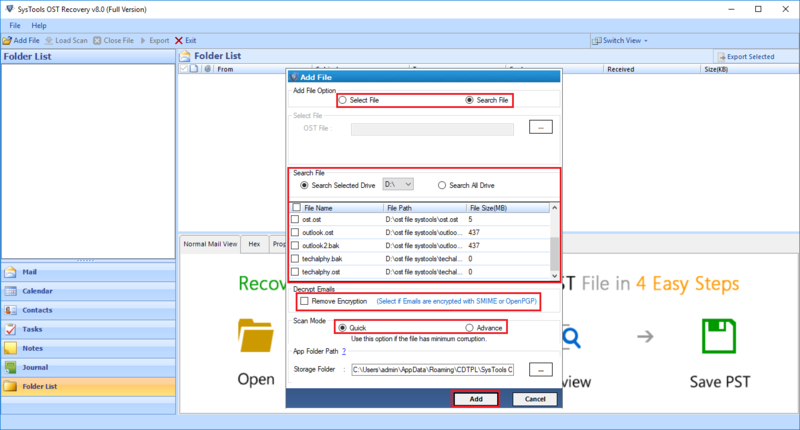 This feature within the tool enables the users to maintain folder hierarchy of the files in the same way as in the original file after the conversion process. 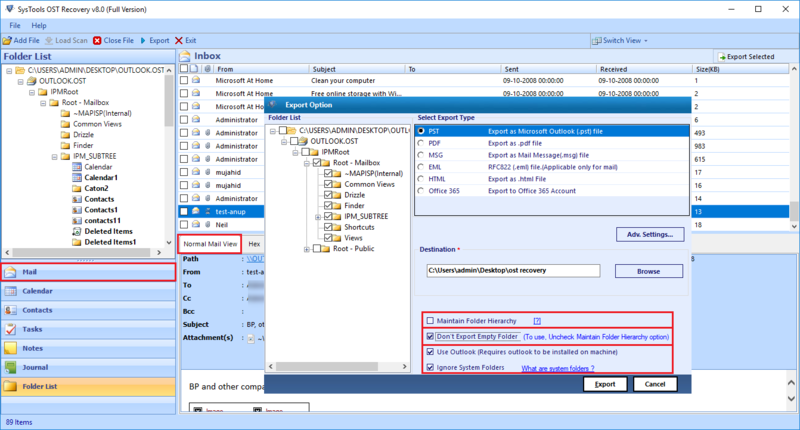 It provides an option “Maintain Folder Hierarchy” so users can select either maintain folder structure or not before the conversion of OST emails to PST. The OST management tool comes with host of features to make the whole conversion process a smooth process. All in one OST File to PST Migrator has the ability to convert all the important information from the Exchange server OST to Outlook PST format (Emails, contact information, Calendar, task, and journal ). 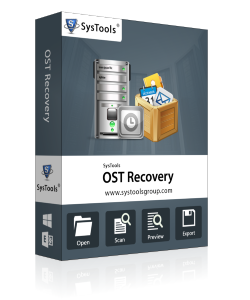 The ability for quick and deep scanning for recovery of damaged OST files. Comes equipped with advanced filtering option to convert only the selected emails which in return helps you to remove the redundant or unnecessary emails. This OST File to PST converter software requires a user to have MS Outlook email client to perform the conversion of OST to Outlook PST. OST file to PST converter enables the users to convert OST to PST, EML, MSG file format. Moreover, this tool also export Outlook .bak to Outlook PST. This versatility is what makes software efficient and also, facilitates the users to split large PST file by size. 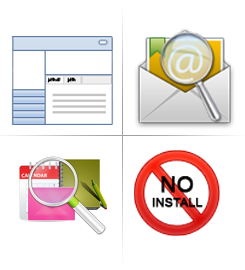 Apart from the core features the software exhibits additional features that's makes it one of the best OST to PST exporter software for example the software works great for forensic analysis purpose as well as if you wish to split the PST file in manageable size. Gives you the complete autonomy to manage the PST file size and is great in cases when after performing Exchange OST to Outlook PST conversion the size of the .pst file gets huge. Using the tool you can decide the file size of the converted PST file. The OST to PST converter tool is your all-weather friend and will take care of your conversion and file splitting needs in the most professional way. Get the best conversion in the least time using the utility. Fast, efficient and reliable way to make the conversion happen, so get started now and download the OST to PST exporter for free to test its ability and import easily all your emails on Outlook email client and pay only if you able to succeed else we will transfer back your money with our 30 days money back guarantee. Though it is not rare certainly there is instance when you might have to perform the conversion to PST file format. Like in cases if something goes wrong with your Exchange Server and you are not able to attach the OST file with the configured profiles then in such case you can make way around by converting those OST files into PST format which is the friendlier and compatible storage format of the Outlook Email Client. Demo version of software will generate Preview & Export only 25 Items per Folder from OST file to Outlook PST/ Office 365. How can I migrate OST file to PST? Is it possible to convert OST file to PST format? Yes, you can easily export OST to PST file format. Moreover, this tool makes the very simple process to migrate OST file to PST. For the conversion of files users just have OST file, Outlook email client, and the tool. If mailbox containing more than 20 GB of data then how much time will they consume during conversion? It depends upon the amount of data being converted. This tool is capable enough to deal with large sized mailbox. Moreover, there is no file size limitation imposed by the tool. Is this freeware OST to PST converter software completely free? Partly Yes, though you will be able to view everything that exists inside your .ost file but in order to make the conversion you have to purchase the software. How can I convert Outlook .bak to PST file format? .bak file is the replica of OST file. 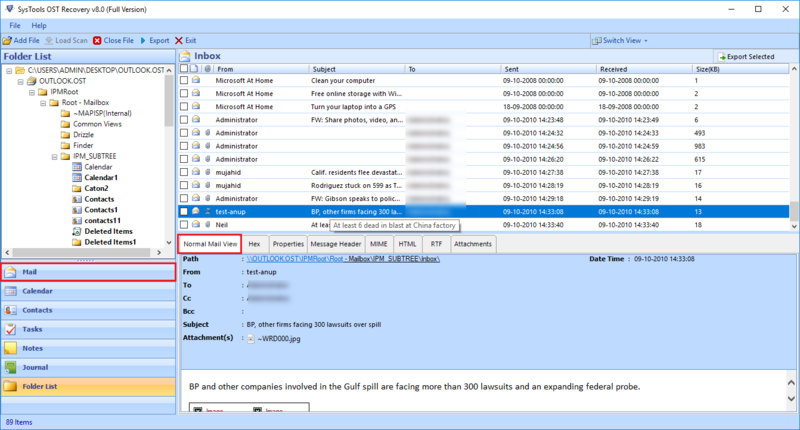 Users can get emails, calendars, contacts and other data items from the .bak file by using this OST to PST converter. Moreover, this tool supports Outlook .bak file conversion to PST, EML and MSG format. Can I use the software on Windows Vista machine? Yes, OST to Outlook PST Converter tool is compatible with all the versions of Windows operating system and works great with them. I have ANSI OST file, how can I export OST to PST in Outlook 2007? If you want to migrate OST file to PST then you can use this tool. It supports both ANSI and UNICODE OST file and generates PST in UNICODE format. So, users can easily perform migration of OST files within few clicks. What are the platforms supportable by the software? The OST file to PST conversion software currently supports Windows 7, 8, 8.1 and 10 and is compatible with MS Outlook 2007, 2010, 2013 and 2016 versions. The OST to Outlook PST conversion software works really well and was able to handle such large OST file exceptionally well. A true enterprise level software and is recommended to anyone who wishes to convert OST to PST file format. Converting all mailbox data seemed like an impossible task. But, thanks to OST to PST exporter, this software easily export all mailboxes to PST without any data loss. Completely satisfied with this tool. I was searching for a tool which can easily export OST to PST. However, one of my colleagues suggested me use this tool. This software really helps me to export emails to PST. Special thanks, to the development team for creating such utility. OST to Outlook PST Converter software works really great and has the very simple graphical interface. The best part of the software is that it is not cluttered with unnecessary features, it does and shows only what is required for the said purpose.